A man who spent many years collecting metal artifacts from the ocean near the power plant where he worked in Israel secretly amassed a huge collection of valuable and ancient treasures. Archaeologists were recently given the trove of artifacts after the man, who had worked for years at the Orot Rabin Power Station in Hadera, on the coast of Israel, passed away and his family began sorting through his belongings. They found a remarkable collection of valuable and ancient items. The man’s collection also included valuable mortars and pestles, candlestick fragments and other goods manufactured during the Fatimid Dynasty from the 11th century. The items were probably made in Syria. The power plant worker, Marcel Mazliah, had been employed at the Orot Rabin Power Station since it was first constructed in 1973. The coal-fired plant, which is Israel’s largest, lies on the banks of the Mediterranean, and over the years, Mazliah had been quietly collecting objects washed up from the sea. After Mazliah’s death, his family asked representatives from the Israel Antiquities Authority to look at his treasure collection. As it turned out, the collection contained genuine artifacts that were likely lost from a metal merchant’s ship at some point in the past. 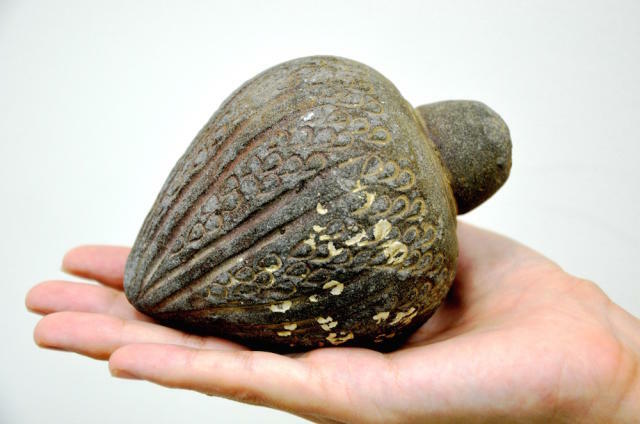 In addition to the stunning Bronze Age pin and the Fatimid-era treasures, the collection also included an ancient hand grenade of a type used by the Crusaders, Ayyubids and the Mamluks hundreds of years ago. Mazliah’s family will receive a certificate of appreciation for handing over the artifacts to the Israel Antiquities Authority. With hundreds of civilizations occupying the region over the millennia, Israel is full of ancient artifacts, many of which have been discovered by accident by ordinary citizens. For instance, in 2015, cavers found a trove of ancient coins and jewelry, while that same year an unsuspecting Israeli family found a historic ritual bath lurking beneath the floorboards of their apartment.